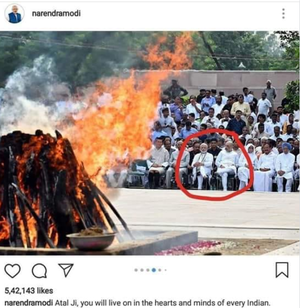 WhatsApp messages and Facebook posts accompanying a picture of Modi sitting disrespectfully at late Indian Prime Minister Vajpayee's funeral has been proven to be FALSE. 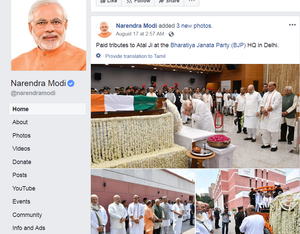 Verify.Wiki crowd-sourced research and AI technology revealed the account the picture was shared was not the official account of Prime Minister Modi. The photo is also proven to be edited. If anyone who can contribute either supporting or opposing evidence to this claim, can edit this page and provide valid references. All contributions will go through a crowd-sourced verification process. The official and edited photos are given below for reference.